vacancies in MRO Nagpur. There are total 12 vacancies in the AIESL Assistant Supervisor recruitment. The distribution of vacancies is according to the reservations. The interested candidate should be a Graduate from the required area. The maximum age limit is 33 years subject to conditions. The initial probationary period is 5 years for this AIESL Assistant Supervisor Jobs. 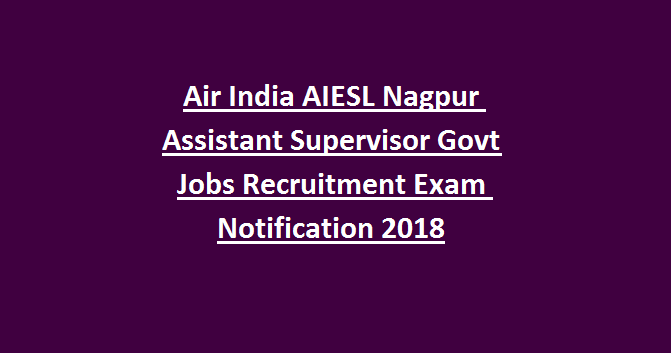 Walk in interview for AIESL Asst Supervisor jobs is 03-12-2018. The applied candidates will be selected on basis of Skill Test followed by Interview. The candidates must pay an application fee of Rs.1000. For more details and further information regarding educational qualification, age criteria, pay scale, selection procedure, available vacancies and applying process about AIESL Assistant Supervisor Jobs Recruitment 2018 go through the information given below. Venue: : Human Resources Department, MRO, Nagpur, Plot No.1, Sector 9, Notified Area of SEZ, (Near Khapri Railway Station), MIHAN, Nagpur – 441108. The official notification does not specify any lower age limit. The candidates applying for AIESL Assistant Supervisor Jobs should not exceed the age of 33 years for General, 36 years for OBC candidates and 38 years for SC/ST candidates. The candidate applying for AIESL Govt vacancies should be a Graduate from Govt recognized university and Diploma/certificate course (Minimum 01 year duration) from recognized institute with a minimum of 1 year of post-qualification with work experience in data entry / computer applications in any organization. The candidate should have a BCA/B.Sc IT/Graduate in IT. The applied and selected candidates will earn a monthly pay of Rs. 15,180 with an increment of Rs. 400 every year. The terms and conditions may change according to the amendments. The initial probationary period is 5 years for Air India Jobs. The authority may increase the span of the employment basing on the performance of the candidate. The interested and eligible candidates can apply for AIESL Assistant Supervisor Jobs by paying an application fee of Rs. 1000. The candidate can pay the fee by way of Demand Draft. The DD should be drawn in favor of “Air India Engineering Service Limited” payable at Nagpur. Relaxations are provide for Ex-Serviceman and SC/ST candidates. The applied candidates have to attend for skill test and interview which will be conducted by the AIESL. After filing the applications, the date and details regarding skill test and interview will be given in the Air India website airindia.in on 03-12-2018. The interested and eligible candidates can apply for AIESL Asst Supervisor Jobs by downloading the application form from the official notification. Fill the application form with the required details and attach required testimonials. Pay the application fee by DD. 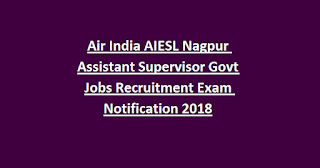 For further information and more details regarding Air India Engineering Services Limited Assistant Supervisor Jobs refer the official notification.